Mint chocolate chip ice cream reminds me of the hot New Zealand summers we had as kids, where we used to spend the day at the beach. At the end of the day we’d call into the local Dairy (a corner store) and each choose a scoop of ice cream which, more often than not, ended up half melted down our hands before we’d even got back to the car. Back then the choices were pretty simple. It was either vanilla, neapolitan, mint or orange chocolate chip, and if you were lucky, goody goody gum drops. These days you don’t find many Dairy’s that scoop their own ice cream anymore. And in the more remote coastal regions, you’d be hard pressed to find any that stocked dairy free ice cream. Although I personally think that would be a fabulous idea! 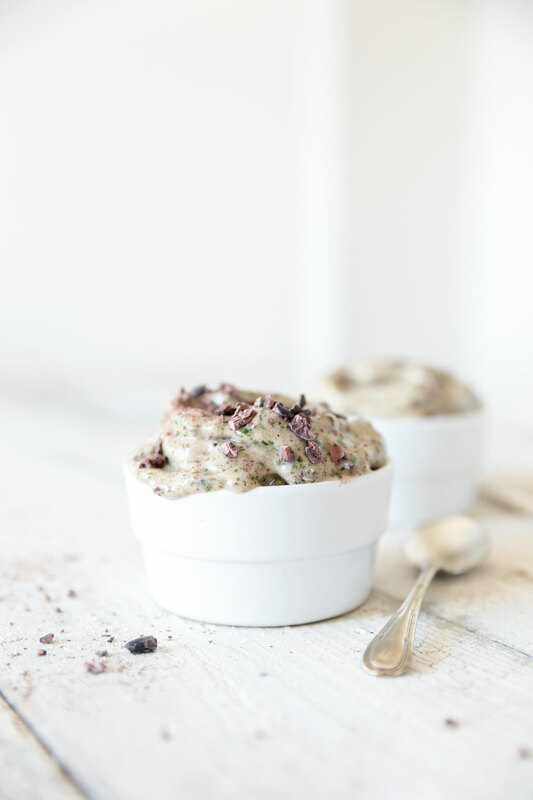 In honour of the warmer weather approaching, I’ve created a nostalgic but much healthier version of mint chocolate chip ice cream or “nice cream”. After a quick google search it appears I wasn’t the first with this recipe idea (dammit), but I guess it just goes to show it must be a great idea. This recipe only has 4 ingredients: bananas, mint, a little sweetener, and cacao nibs. It has a lovely fresh mint flavour and is very easy to make. The hardest part is remembering to freeze all the ingredients ahead of time. I’ve used raw cacao nibs as the ‘chocolate chips’ as these are a great superfood full of antioxidants and have a strong chocolate flavour. However, the’re quite bitter so if you’re not worried about keeping this nice cream entirely raw and sugar free, feel free to use chopped up dark chocolate instead. The reason for freezing the ingredients beforehand is to prevent the nice cream from melting before you have a chance to eat it. 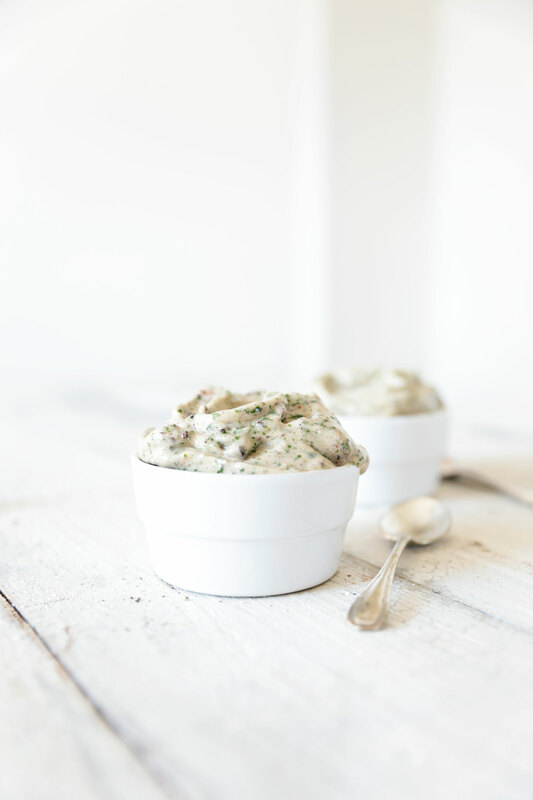 My advice is to keep a small stock of ingredients in your freezer (as you would for smoothies), so that if a nice cream craving hits you can whip it up in minutes! 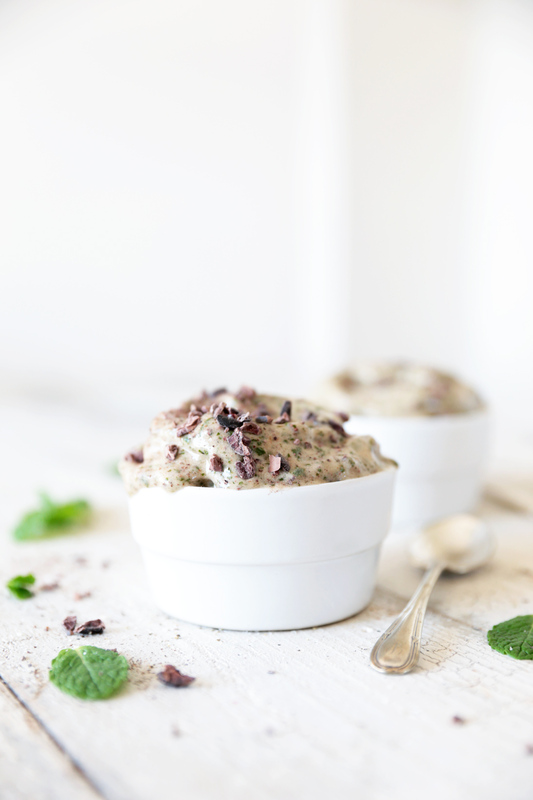 This mint chocolate chip nice cream also makes a great last minute dessert, especially if you find yourself with unexpected dinner guests. Enjoy! Prep ahead by freezing the banana, mint leaves and cacao nibs/chocolate. To make the nice cream, place the bananas, mint and sweetener into a food processor or high speed blender and blend until well combined. It will form a smooth ice cream consistency very fast – be sure not to over blend and melt the mixture. Add the cacao nibs and pulse to combine. Serve immediately sprinkled with extra cacao nibs – or place in the freezer until required. *Note: freezing the mint and cacao nibs beforehand ensures your nice cream doesn’t melt before you get a chance to eat it! Where has this recipe been all my life?!?! Looks amazing, I will definitely be trying it out! Thanks Katie – hope you enjoy it! I just started eating healthier and its so hard to find an ice cream I like that won’t blow all my calories in one sitting. This looks fantastic!